The kitchen is perfumed with garlic and coriander, the lightness of rose in the chilli spiced harissa, and the subtle creamy meatiness of chicken, the meat no longer able hold itself to the bone, and the skin on top turning golden and crisp. 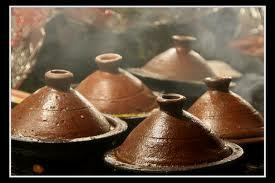 A tajine. It was the ‘antique’ pickled lemons found, no discovered, at the back of Aunt J’s fridge the week before that started me off on a Maghrebine theme, and eastern influences in the food surely means an eastern influence in the wine, Hochar et Fils 2003 (Bekaa Valley 12.5%, Vintage House £11.75). Lebanese, surely near enough (it looked so close on the map)? Not wanting to have the olfactorial distractions while tasting this wine, I have moved to a quieter, scent free room and start to pour, the bottle having been opened earlier to get to a reasonable temperature from the chill outside. Holding the glass up, the wine is clear, as are the legs, and light cherry red with tinges of garnet. Slowly swirling and turning my nose into the glass I get leather. A full pupil dilating leathery scent with a back note of walnut mustiness (a panic as I wonder whether this is cork taintage, but thankfully it is not). Prunes and damsons come to the nose, and further swirling releases the cherry, some green pepper and herbaceousness. The overarching sense is though is the leathery, almost like opening a brand new briefcase; meaty, that slightly oaty bloody smell that comes from the butcher’s shop; damp straw and hay, and all the elements of the cow shed (minus the “you-know-what”). I am excited and curious. I want to taste. And what taste! A soft muted berry loveliness, with lots of tannic woodiness and hints of vanilla and cream. That lightly perfumed berry from the Cabernet Sauvignon and that nutty note. Citric sharpness is thrown in for good measure however, and, surprisingly there is no flintiness or minerality. I say surprising as this wine is grown on gravel and limestone, not, say for instance a clay soil, so I would have assumed some stoniness would be drawn into the flavour. However, because the winters are rainy and rarely suffer frost, the soil drains well reducing the chance of mildew and ensuring the new growth fruit develops well. Longer milder summers lower the risk of disease further, and the altitude (1000m above sea level) prevents heat drying the grapes out. Low yielding old vines of Cabernet Sauvignon, Cinsault, Carignan, and Grenache (that would explain the leather) are blended, partially aged in oak for 3 months, and bottled during the final year. Each yield and therefore blend varies so no vintage is the same. So, back to the glass. Left for a bit the aromas are the same rich leather and blood and herbs, but the taste alters somewhat as the room temperature helps the wine’s development in the glass. Allowing it to settle means I get those fruitier darker berries in a richer, purer concentration on my nose. A contrasting sweet and sourness from the cherry and blackcurrant, and a smokiness of raspberry with the rounded more muted blackberry notes. And then, the subtlest, subtlest hint of cinnamon. But on the mouth? Wow! Brie and cheese skin pungency to the tongue. Sour cherry and some rosehip sharpness. A perfect and palatable natural concentrated sweetness like the confectionery cherry flavour, but all natural. Outside, the damp chills reach through even the thickest of wool jumpers, but inside the wine brings a warmth that reflects the anticipated exoticness of an English Tajine with a touch of "Eastern promise". Rich in flavour and scent but, being a second wine, not as spicy and complex as its counterpart the Chateau Musar, Hochar et Fils still represents excellent value for money.